Must continue to post! Must not let blog die so soon! 2) I would be making lots of stuff which would never actually help with gameplay. This second is the biggie. Verisimilitude is awesome, as is having a coherent world history and setting. But they are secondary to having a solid play experience. Making an entire world didn't seem like it would really help with that. I decided to try out the suggestions of some folks (unfortunately I don't remember who, else I'd totally toss them a link) and try generating from the bottom up. Just presenting the basic information which adventurers would need to know. "This is the town you're in, Sanctuary. You know of interesting things here, and here." (pointing to 2, 14, and 4) "The Baron usually stays in his warcamp, here. You don't know what some of these other symbols indicate." This, along with the little rumors I give each character at the start of play ("You know of an ancient treasure vault almost directly northeast of Sanctuary," and so forth) give players something to look for and a reason to go out and start exploring. 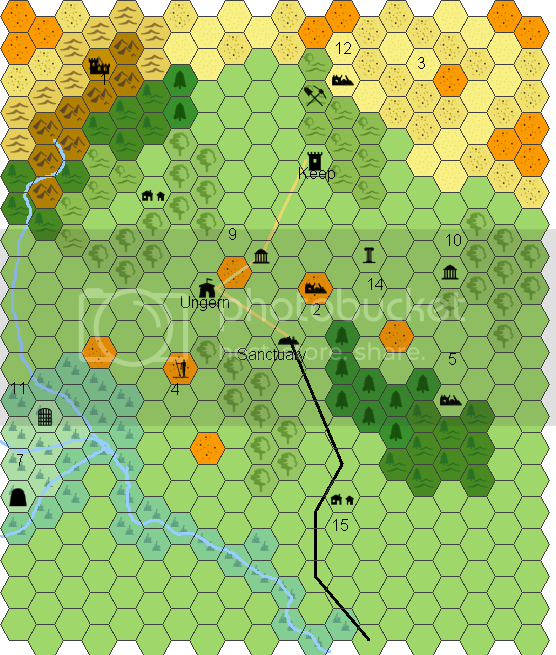 The geopolitics of the region are pretty much completely undeveloped - the campaign is set on the frontier, with a few renegades living north of Sanctuary, but by and large undeveloped, mostly uninhabited, wilderness. There are other nations to the south, on all sides - but they don't really matter, save as stage dressing, for now. If my players decide "hell with Sanctuary, we're moving to Vosthenca," then they'll start journeying south, and I'll have some time to put Vosthenca together. If you haven't seen it already, check out Zak S's "Conan Knew More About Cimmeria Than Howard Did." (NSFW) Strongly recommended, though the site itself is not quiiiite work safe, as you might be able to guess from the title.